Here is a list of famous people from Comoros. Curious if anybody from Comoros made it our most famous people in the world list? Read the aformentioned article in order to find out. Ahmed Abdallah Mohamed Sambi is a Comorian Islamic leader and politician, and former President of Comoros. He is popularly known as 'Ayatollah'. After easily winning the 14 May 2006 presidential election with 58.02% of the national vote, Sambi was inaugurated as President of the Union of the Comoros on 26 May 2006. 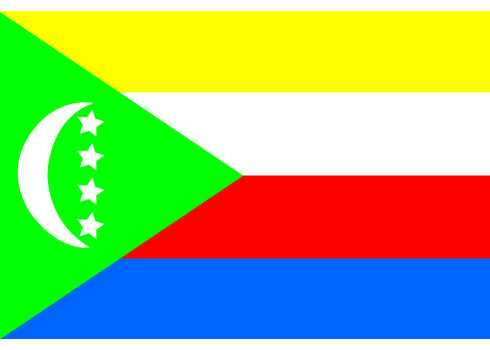 It was the first peaceful transfer of power in the history of the Comoros. Fazul Abdullah Mohammed was a member of al-Qaeda, and the leader of its presence in East Africa. Mohammed was born in Moroni, Comoros Islands and had Kenyan as well as Comorian citizenship. He spoke French, Swahili, Arabic, English, and Comorian. Ahmed Abdallah Abderemane was a Comorian politician. He was President of the Comoros from 25 October 1978 until his death. Colonel Mohamed Bacar was President of Anjouan, one of the three autonomous islands that make up the Union of the Comoros, from 2001 to 2008. He is a former chief of police on Anjouan and has studied extensively in France and the United States. He was part of a military coup on Anjouan in August 2001 and soon became President. It is alleged he rigged the elections to become the first president of Anjouan in March 2002, in part due to his leading role in the separatist movement. He was ousted by the combined forces of the Government of the Union of Comoros and the African Union in the March 2008 invasion of Anjouan. Mohamed Taki Abdoulkarim was President of the Comoros from 25 March 1996 until his death on 6 November 1998. Said Mohamed Cheikh was the head of the Government of Comoros from 1962 until his death in 1970.Cheikh served in the French National Assembly from 1946–1962 and He was also the president of the Parti Vert and of the Governing Council. Tadjidine Ben Said Massounde was a Comorian politician. Massounde served as Prime Minister from 27 March 1996 to 27 December 1996. After the death of President Mohamed Taki Abdoulkarim on 6 November 1998, he became interim President. His government was overthrown in a 30 April 1999 military coup led by Colonel Azali Assoumani. Combo Ayouba was a Comoran colonel and senior member of the Military of Comoros. He was one of the highest-ranking military officers in the Comoros at the time of his assassination in 2010. Ahmed Abdou is a Comorian politician. He was prime minister of Comoros from 27 Dec 1996 to 9 Sept 1997. Mohamed El-Amine Souef is a Comorian diplomat and former foreign minister, ambassador to Egypt, and Permanent Representative to the Arab League. He has been appointed deputy Foreign Minister in charge of the Arab World by president Mohamed Taki Abdulkarim in 1998. He first became foreign minister in 1999, following the military coup of Azali Assoumani. He resigned briefly in January 2002, along with Azali Assoumani, to make way for a transitional government, but he was reappointed a few months later when Assoumani won elections and regained power. He lost his post again in July 2005 during a cabinet reshuffle. After the reshuffle,Mr. Souef was named Ambassador and Permanent Representative of the Comoros to the United Nations in New York. Mr. Souef Mohamed El-Amine is currently working as UNAMID staff member since 2011. M.SOUEF is a scholar and he recently published among others three books on the comorian history and policy: 1-Les Comores en mouvement; 2-Les grands défis de la politique étrangère des Comores;3- le Transport aérien aux Comores entre Souveraineté et Sécurité Ed,de lalune. Hamada Madi, widely known as "Boléro", is a Comorian politician, former Prime Minister and interim President. Born on the island of Mohéli in 1965, he gained a degree in constitutional law in Ukraine and worked as a political adviser in Comoros, becoming secretary general of the Comoros Republican Party. Before being appointed Prime Minister on 29 November 2000, he served as Secretary General for Defense in the Presidency and played a leading role in peace negotiations with Anjouan, leading to the Fomboni Accord. In January 2002, it was agreed, despite some opposition, that he would replace Colonel Azali Assoumani as interim head of state and oversee the Transitional Government of National Unity in the run-up to the legislative and presidential elections. Due to his Mohélian origins, he was ineligible to run for the union presidency in 2002, when the first four-year term was reserved for a Grande Comorian. After the return of Azali to the presidency in May 2002, Hamada Madi was kept on as special advisor without portfolio with Union cabinet status. After waiting several months Bolero got the permission from the Presidency in April 2007 to leave the country. He is living currently in Paris, France in exile. Abbas Djoussouf was a politician in The Comoros. He was Prime Minister from 22 November 1998 until 30 April 1999. He was the main opposition leader when named Prime Minister by Tadjidine Ben Said Massounde in a move to help soothe secessionist movements across The Comoros. He lost office when Colonel Azali Assoumani assumed power in a military coup on 30 April. Maoulida Daroueche is a Comorian hurdler. At the 2012 Summer Olympics, he competed in the Men's 400 metres hurdles but was eliminated in the first round. is a Comorian footballer who plays for Coin Nord de Mitsamiouli. Ahmed Mohamed was a politician from Comoros who served in the French National Assembly from 1962-1978 . Abdoulhamid El Mamoun is a Comorian footballer who plays for Volcan Club Moroni. Mohamed Hassani Mbalia is a Comorian footballer who plays for Élan Club de Mitsoudjé. Mahamoud Mroivili is a Comorian footballer who plays for Coin Nord de Mitsamiouli. Heoumadi Halidi is a Comorian footballer who plays for AJSM Mutsamudu. Djamal Msaidié is a Comorian footballer who plays for Coin Nord de Mitsamiouli. Damine Abdoulhaniou is a Comorian footballer who plays for Chirazienne Domoni. Said Olivier Ahamada is a footballer who plays for Comoros national football team. Djabir Issouf is a footballer who plays for Comoros national football team.